Prom, Evening Wear and Bridal Boutique based on Princes Avenue, Hull. 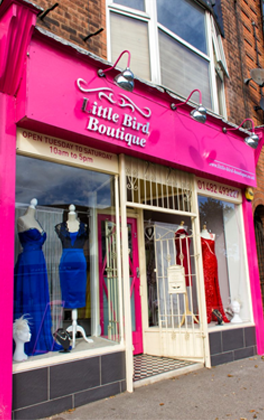 Welcome to Little Bird Boutique. We are a specialist Prom, Evening wear and Bridal shop. With over 500 dresses in stock we have dresses suitable for all occasions such as Prom, Black Tie, Cruise, Leavers Balls, Graduation and Special events / Parties. Our dress policy for evening wear ensures that we will not sell the same dress to your event, not even in a different colour! Our wedding collection was launched in November 2018. We have dresses available to order and to take away on the day in a range of sizes. Our wedding collection is all priced under £1000 with payment plans available in store. We also provide accessories, veils, underskirts and any other addition bridal items needed. Appointments are recommended but we also accept walk ins. Our Busy season is between October - April so we highly suggest you book an appointment, especially if travelling from out of town.